This report was shared during Poster Session A (Poster #46) on October 31, 2013, at the 18th annual meeting of the Connective Tissue Oncology Society in New York City. If you took part in this survey or if you have benefitted from this report, please share your thoughts. Make sure to let us know if you think something important is missing from this report. Nearly a decade ago, a study in the British Medical Journal reported that the Internet was "changing the way that people learn about health and illness.2" The study showed that cancer patients were using the Internet to seek information in all stages of the cancer journey, from diagnosis to follow up care. One of the study’s most interesting findings was that cancer patients appeared to be using the Internet to "acquire expertise to display competence in the face of serious illness.2"
Despite concerns within the healthcare community that patients may be led astray by online information, most people still consult their doctors first for help when facing a serious health issue.7 What then is the role of the Internet for today’s cancer patients and, more specifically, for sarcoma patients? And why should medical teams and sarcoma advocates care? In this article, we report on the results of an online survey conducted by the Liddy Shriver Sarcoma Initiative. We discuss the Internet resources available to people dealing with sarcomas, how they are using those resources, and how advocates and medical teams can help patients and their supporters who are actively seeking online information. More than half of the survey participants (57%) were sarcoma patients and survivors, 41% were caregivers and family members, and 2% were friends and other supporters. About 74% of the diagnoses were made since 2008, with an additional 20% made since 2001 and the final 6% made before the year 2001. A strong majority (82%) of responses came from women. Most (61%) came from people between the ages of 41-60, with 21% under the age of 41 and 16% over the age of 60. 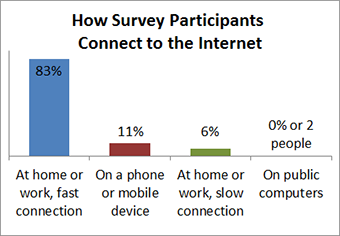 More than 80% of survey participants have a high-speed Internet connection at home or at work that they use to access sarcoma resources. More than 10% of those surveyed were using mobile phones or devices. And just a small fraction of users, about 6%, access online information via slow connections or public computers. At first, my doctor told me not to go on the Internet and not to worry. But I found that the more I knew, the more I could contribute and make informed decisions. It is difficult to digest all of the information that the doctor's tell you during appointments. It is reassuring to come home and be able to educate yourself about the information you are trying to digest. To find detailed information that applies to them, patients and their supporters may have to weed through hundreds of search engine results. Some will learn to search more effectively by trial and error (using more specific queries like sarcoma newly diagnosed, sarcoma support or osteosarcoma diagnosis) in order to bring the most relevant information to the top of their search results. A fibrosarcoma survivor adds: "It's a challenge to trawl through the dross on search engines, and in reality there is often little sarcoma-type-specific research or data, which I guess isn't the 'Internet's' fault!" Those who find what they need often return to the Internet to learn more. About 60% of patients and supporters in our survey visit cancer or sarcoma-related websites more than once a week, and 1 in 3 visits those sites daily. The Internet has provided me with information that would seem overwhelming to receive from doctors all at once. It has allowed me to read at my own pace and control the information I decide to take in. Not surprisingly, participants in the Initiative’s survey report that they value most the ability to find information about their specific situation or subtype of sarcoma. These findings match up with Internet statistics at SarcomaHelp.org, where comprehensive articles on sarcoma subtypes are, by far, the most frequently visited pages on the site. When people search for a sarcoma subtype online, they are likely to find a few relevant results that provide detailed, credible information. They will also encounter numerous results that are not up to date, accurate or detailed enough to be helpful. Unfortunately, patients dealing with the rarest sarcoma subtypes may find little information about them. Information is critical to dealing with sarcoma. Doctors tend to have limited time and attention. What patients learn online helps them deal with sarcoma better, helps them ask informed questions and helps them feel less alone. The web works. I learned online where to go for a second opinion and where to go if we need access to a clinical trial. Our hospital provides very limited information about treatment and research happening across the country. We were made aware of our son's current clinical trial because a CaringBridge friend told us about another family going through this trial. 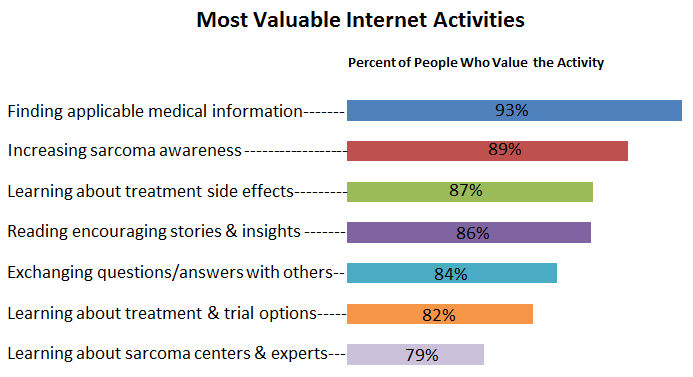 Those surveyed value Internet resources that help them understand their medical options (learn about sarcoma centers, treatments and clinical trials) and deal with treatment side effects. 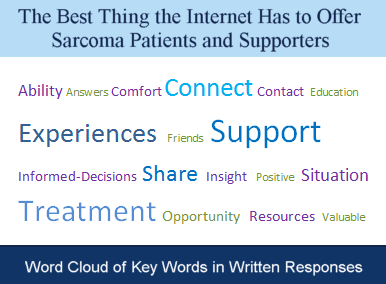 In addition, 89% of patients and supporters value increasing sarcoma awareness online, 86% value reading inspiring stories, and 84% want to exchange questions and answers with people in a similar situation. 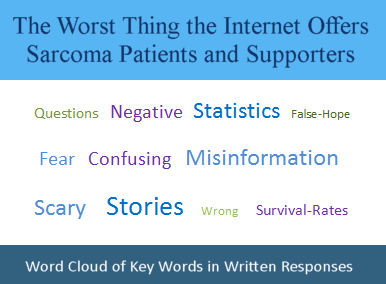 Our survey shows that about 78% of sarcoma patients and supporters using the Internet understand that it is important to check the validity of online articles. They report many intelligent ways of doing so, including looking for the authors’ credentials, checking for legitimate sources at the end of articles, asking a knowledgeable peer for an opinion about questionable information and searching for additional studies and articles that report similar findings. A Note about Outdated Information: A number of interesting comments were written about the publication dates of online articles. Many survey participants believe that sarcoma articles quickly become outdated. One caregiver writes: "Cancer treatments advance all the time; do not give us out-of-date information." Despite this common sentiment, it is the Initiative's experience that review articles on sarcoma subtypes remain correct for many years because of the slow advances made in treating many of these rare diseases. People dealing with cancer trust healthcare teams to provide diagnosis and treatment, but they rely on their peers and loved ones to help them cope with the daily difficulties caused by the disease and its treatment.9 Studies show that at least 20% of cancer patients and supporters choose to go online to find peers who can relate to their struggles.9 Those with rare cancers may be more likely to seeks support online because their local peers cannot relate to the sarcoma experience and because local sarcoma support groups are rare. Indeed, 84% of participants in the sarcoma survey value connecting with others online, indicating that asking questions and receiving answers from other patients and supporters is important to them. As a survivor explains, "At every hospital or cancer center you can find a breast cancer support group. However, when you have a rare cancer, you are not afforded this benefit. I found the Chondrosarcoma Support Group online the week I diagnosed in 2009. I have made friendships and have been able to correspond with people all over the world with CS. We support each other and fill that hole that is not found at the local level." As a physician, researcher and sarcoma patient, I think I can say with authority that medical providers have little insight into how harrowing and isolated life can be with this disease. Networking with other patients, their families and supporters has provided me with the most enlightening, meaningful and reassuring moments of my life as a sarcoma patient. I had difficulty when first looking for information, not necessarily understanding terminology, and had mix ups with different names for drugs. But that is where sarcoma support groups were able to bridge the gap between finding the information and understanding it. The experience of living in the sarcoma world is immensely valuable. Despite the rarity of each sarcoma subtype and the diversity of sarcoma tumor locations, treatments and results, the global nature of the Internet allows people to quickly connect and communicate about sarcoma's specific challenges. One liposarcoma patient who was frightened about her surgical options is the perfect example: "I was given the choice to get clear margins by removing my hamstring or to leave dirty margins by just removing what is left of the tumor from previous surgeries. Everyone [online] told me to go for clear margins and gave me examples of how well they are doing without a hamstring!" 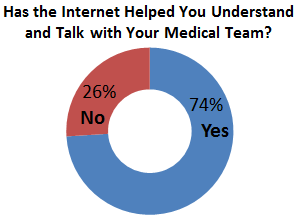 Patients and caregivers in Internet support groups find more than medical information when they join a group. They also find caring people who take the time to get to know them and respond to their questions. Struggling patients and caregivers are often gently reminded that it is important to take care of themselves, to seek counseling or ask about medications that can help with anxiety, insomnia, depression and other difficulties frequently overlooked during a crisis. One caregiver writes, "I find it comforting to be in contact with other people who 'get' the journey. Understanding, just a word of encouragement or a laugh at the shared difficulty, is a relief in the burden of the journey." 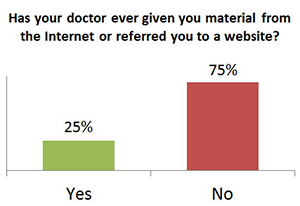 About 20% of survey participants use online resources so much that they feel like experts in their disease. About half of these knowledgeable patients and caregivers, or 11% of those surveyed, have also interacted with "scores" of people online. Most doctors do not realize how comforting it is to share your pain, anger, and sadness with others in the same situation. Folks online aren't trying to 'doctor' other folks but connect with them. Based on our experience over the last decade, an even smaller percentage of online patients and caregivers (about 5%) choose to stay active within the online sarcoma community for years, often long after their own medical crises end. They gain an abundance of knowledge by frequently consulting peer-reviewed literature, discussing issues with clinicians and researchers, and learning from and assisting hundreds of patients and their families online. This special group of 5% become micro-experts on a specific disease, offering others invaluable insights about treatment options, clinical trials, side effects, psychological and social struggles, pain control, grief and end-of-life care. Some also become skilled at recognizing the needs of others and helping them to meet those needs. One leiomyosarcoma survivor writes, "The level of 'expertise' I have achieved as a patient would be impossible without the Internet. I am a kind person - the Internet gives me an opportunity to help others like me. I feel good when that happens." ACOR.org: One of the oldest and most useful resources for sarcoma discussion online is the Association of Online Cancer Resources (ACOR), where more than 4,000 people exchange e-mails about their experiences with several kinds of sarcoma. Unfortunately, many people are unaware of this helpful resource until they stumble upon a site that refers them to it. When they do join ACOR, most members use separate lists based on sarcoma subtype, so they can miss relevant information and experiences that are shared on different sarcoma and cancer lists. ACOR recently announced that it will move its communities to an updated interface that is currently in development at SmartPatients.com.10 While ACOR’s site connected people based on their diagnosis, the new site will connect people in more ways based on a tagged discussion system. Discussions will become pools of information to which any member can contribute. One can imagine the resources that might be created with such technology, as hundreds of patients and supporters write about their experiences with specific treatment regimens or clinical trials. ACOR’s founder, Gilles Frydman, explains: “We are especially excited about the ability to support conversation across traditional disease boundaries, like when patients with different cancers are talking about the same drugs or molecular pathways.10” Whereas ACOR is a non-profit entity, the new service at SmartPatients.com is a for-profit company that will "make money by partnering with pharmaceutical and biotech companies, scientists, researchers, and educators who want to better understand the experiences, insights, and needs of patients.11"
Facebook.com: A quick search for sarcoma or a specific type of sarcoma on Facebook leads to an immediate connection with dozens of sarcoma support groups and thousands of members. These groups have been started by organizations and individuals dealing with sarcoma, and some of them are moderated by volunteers or organizational staff. Group members can make text posts, share photographs and comment on each other’s posts. Patients and supporters who meet in a group can then become Facebook “friends” to share their extensive personal profiles, which often include their daily thoughts, life events and photographs. Facebook groups include those for angiosarcoma, chondrosarcoma, chordoma, dermatofibrosacoma protuberans, Ewing's sarcoma, liposarcoma, osteosarcoma, rhabdomyosarcoma, synovial sarcoma, the Sarcoma Alliance and Team Sarcoma. Online Health Journals and Blogs: Support sites such as CaringBridge and MyLifeLine offer publication services to help meet the needs of people dealing with medical crises. On these sites, and on traditional blog sites, patients and caregivers can create online journals that summarize their sarcoma stories. They then publish updates as new health events occur and receive supportive comments from family, friends and online connections who are dealing with similar challenges. Website Forums: Organizations and advocates often include discussion forums on their websites, and some contain thousands of helpful messages. 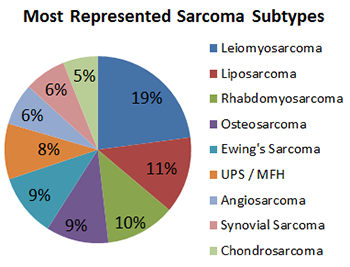 Most of these communities are focused on sarcoma subtypes or sarcomas in general. Unfortunately, because each community is located on a separate website and appeals to a certain population, this information may not reach all of the people who could benefit from it. The same issue exists on Facebook, where many groups have been built based on sarcoma subtype. This means that two people of the same age who receive the same treatment for sarcomas in the same location may never meet because they join different online groups based on their sarcoma subtypes. 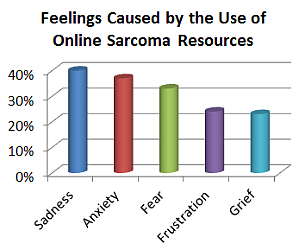 About 75% of people dealing with sarcoma will experience some negative emotions, including sadness, anxiety, fear and frustration, as a result of researching sarcoma online. One liposarcoma survivor writes, "I get so upset when someone dies; all I can think is that will be me soon. It takes me a long time to pull myself back out of that sadness and go on with my regular life." About 31% of those surveyed report that using Internet resources has caused them specific difficulties as they deal with sarcoma. They write about connecting with people who suffer and die, reading (often repeatedly) dire statistics, encountering sad stories, discovering an overwhelming amount of information or not finding enough helpful information. A myxofibrosarcoma survivor writes about one of her challenges: "The information you read on the Internet makes it pretty clear that sarcoma is a cancer of uncertainty. Some days that is hard to handle." "My Overall Online Experience Has Been Harmful..."
The Internet has shown me my son has a tremendous fight on his hands, with the chance of him being alive in five years extremely slim. When you know where to look, there are useful sites and blogs. But there is a danger of being disheartened by what is returned in search engines, leading to a mistrust of the Internet generally. A small subset of sarcoma patients and supporters will be of particular concern to physicians and advocates: 2% of online survey participants indicate that the Internet has had an overall harmful impact on their journey. This number may be higher in the general population, because an online survey is limited by selection bias (people who are frustrated by the Internet are less likely to know about or participate in an online survey). This "harmed" subset of patients reports more hopelessness, distress, grief, anger and depression than others researching sarcomas online. They write about reading contradicting, outdated, grim and inadequate information that has caused fear and confusion. The only positive effect most of these patients and supporters report is feeling informed. Considering patients and supporters who may be harmed: Our survey indicates that nearly half of those who have harmful online experiences either do not know how to tell if an online article is credible or they don't think about credibility when viewing online content. It is possible that these people are dealing with depression or a poor prognosis before using the Internet, in which case consulting the Internet isn't the sole cause of their distress. Still, it is important to be aware that this set of individuals exists and to be open to the fact that some patients and their loved ones are quite discouraged by the information they have found outside of the doctor's office. Though our survey did not deal with privacy issues, they are a valid area of concern with any online activity, and even more so when discussing a person's health. Patients and their supporters may not be aware of the potential consequences of their online activities. Those who write publicly about their health difficulties may find themselves treated differently by their peers and their co-workers. Hiring managers, lenders, landlords and insurance companies can quickly search for applicants' names online and find all of the information they have posted publicly about their life, including health histories and disability status. For this reason, many health discussion sites are not visible in external search engines, and most forums and social networking sites offer customizable privacy settings. Still, there is always a chance that a patient's online health information can found or used in an unexpected way. 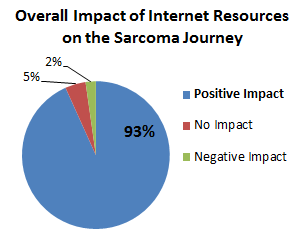 Despite the pitfalls involved in researching a dangerous disease, 93% of survey participants indicate that the Internet has had a helpful impact on their journey with sarcoma. The caregiver of an osteosarcoma patient explains: "While sometimes the information is difficult and scary, we would not have been able to inform ourselves and make the choices we have without the Internet. The good has far outweighed the bad." A fibromyxoid sarcoma patient adds, "I feel more empowered the more I know, even if it might be bad. I want to know what I'm in for." Recent studies indicate that medical patients use the Internet to become more informed about their health, as opposed to questioning or replacing their doctors’ advice.9 Cancer patients who research their condition on the Internet are more involved with their doctors in decision-making and more compliant with treatment and follow-up recommendations.3 One report concludes by advising that health educators recommend Internet use to their cancer patients.12 Another report calls the Internet a "secret weapon" and finds that "having a chronic disease increases the probability that an Internet user will share what they know and learn from their peers. They unearth nuggets of information. They blog. They participate in online discussions. And they just keep going.13"
Our survey shows three major benefits of online involvement for sarcoma patients and supporters: increased medical knowledge and understanding, increased access to specialists and treatment options, and improved coping with emotional and physical challenges. About 88% of sarcoma patients and supporters indicate that the Internet has had a positive effect on their disease knowledge (64% report a great positive effect). 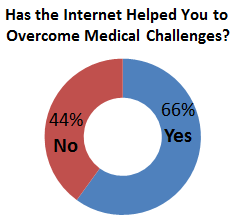 And about 66% of those surveyed report that online resources have helped them to overcome specific medical challenges, including: finding sarcoma specialists, choosing between surgical options, finding cutting-edge treatments and clinical trials. 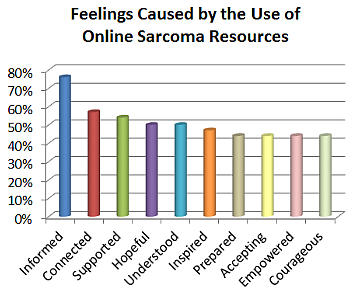 When asked to select from a list of feelings that have resulted from using sarcoma resources online, more than half of those surveyed report feeling informed, connected and supported as a result of using online sarcoma resources. Many go on to write about overcoming obstacles and feeling better emotionally and physically. It would be extremely helpful for doctors to have a few favorite sites to suggest to patients, caregivers and parents. A direct search engine research session can be too overwhelming, especially just after diagnosis. If families are not alerted to the fact that there are sarcoma resources online, doctors are doing their patients a disservice. To be told your child has a rare cancer is a very isolating feeling. Families need to be able to connect with other families. Yes, I realize that it can be frightening to look online, but I think if doctors caution them about reading too much into the stories and statistics, and remind them that every child and every case is different, hopefully that will help. A decade ago, doctors often advised patients not to consult the Internet about dangerous diseases like sarcoma. Today, it is important for medical teams to be aware that the majority of patients who have access to the Internet will use it to research their disease. It would be helpful for doctors and nurses to let their patients know that, should they choose to do research on their disease, they are welcome to write down or print out any information they would like to discuss, including information that encourages, scares or confuses them. Because the quality of online material varies greatly, it would be ideal for each sarcoma team to provide their patients with a list of reputable websites and a set of guidelines for finding helpful medical information online. In fact, more than 100 sarcoma survey participants took the time to write out this very request, many stating that they wished doctors had provided written guidance to them. Sarcoma patients and caregivers tend to benefit most from information that discusses the local and systemic treatments that they need and connects them with others in a similar situation. Websites that are specific to a patient’s diagnosis are especially useful. Finally, sarcoma patients and supporters request that doctors consider communicating with them online, not only in personal e-mail but also in online support groups. A few sarcoma specialists already participate in online support groups as their schedules allow. Often their responses are just a few sentences long, and those brief exchanges can be incredibly helpful to people facing difficult situations around the world. A few doctors have also started well-received blogs to share their experiences and thoughts about current issues in sarcoma practice and research. Many cancer centers, corporations, organizations and support groups worldwide provide sarcoma support, information and research funding. These organizations use various technologies, including discussion forums, e-mail lists, websites, weblogs and social networking sites to meet the needs of online patients and their supporters. I wish there were fewer sites with more information rather than many, many sites doing similar work. I hope the different sites and resources out there will start collaborating more and making all of their wonderful resources available to each other. The more we work together, the more exponential our power to help people will become! Because there are so many kinds of sarcoma, it is inevitable that there will be a number of groups and organizations involved in online advocacy and support. Several survey participants write about the difficulty of visiting numerous websites to find the information that they need. One caregiver explains, "I hope that information is streamlined and consolidated to make it easier for patients and caregivers to get help." While it is unlikely that the number of online organizations will decrease, it would be wise for the leaders of each organization to consider the specific services they can provide the sarcoma community that are not offered or handled well by other groups. When dealing with a rare disease, every hour, every volunteer, and every dollar counts. Avoiding duplicated effort will save essential resources and will make it easier for sarcoma patients and supporters to find what they need. As new leaders and volunteers step up within the sarcoma community, each has the option of working within an existing organization or starting a new one. Considering the costs of structuring an organization, creating website content, making connections, raising funds, filing tax documents, hosting events, and finding volunteers and donors, working within the current support framework makes sense and has the added benefit of helping existing organizations to do more good. For more than a decade, rare cancer patients and their supporters have searched for information and opportunities to connect with each other online. A steady flow of newly diagnosed patients and a trickle of micro-experts have built dozens of sarcoma communities and websites on the Internet. Though there are risks associated with seeking sarcoma information online, thousands of people dealing with the disease do search online, and a majority of those surveyed report that the Internet has helped them deal with sarcoma. We posit that the global, online sarcoma community will benefit from new hardware and software technologies that provide increased functionality and ease of use. Many non-profit and for-profit organizations will offer social networking services that are designed specifically for health-related communications. Old systems of communication like e-mail lists will be replaced with new and improved services for collecting, analyzing and sharing data. Many of these systems will not limit support and involvement based on an individual’s specific diagnosis. Instead, a variety of people dealing with sarcomas and other cancers will share in discussions about the topics that interest them – like coping with cancer, dealing with similar treatments and participating in specific clinical trials. The information will be easier to find and engage in, benefiting more sarcoma patients and supporters than in the past. Indeed, people dealing with sarcomas will experience feature-rich, collaborative online support that can be customized to meet their needs. Integration of nurse navigators14 as an integral part of online discussions (they can also provide feedback to sarcoma centers as to how, for example, to improve and streamline their services based on patient needs). As technology advances, we also envision support groups and advocacy organizations coming together in new ways, better serving the sarcoma patient and medical communities. Controversially, advanced technology will make it possible for organizations to share and profit from online health discussions. Some organizations that facilitate supportive discussion among sarcoma patients will mine that information into useful, anonymous quantitative and qualitative data. The data can then be sold to clinicians, researchers, charitable organizations and for-profit corporations. Feedback about this report is welcomed. Please write to us with your comments. 1. Sorens M & Shriver BD. The Role of the Internet in Sarcoma Care. In: Pollock RE, Baker LH, O'Sullivan B, Randall RL, eds. Sarcoma Oncology: A Multidisciplinary Approach. PMPH-USA, Ltd; In press. 2. Ziebland S, Chapple A, Dumelow C, Evans J, Prinjha S, Rozmovits L. How the internet affects patients' experience of cancer: a qualitative study. BMJ 2004;328:564. 3. Rajer M. The Benefits and Pitfalls of the Internet in Communication with Cancer Patients. In: Surbone A, Zwitter M, Rajer M, Stiefel R, eds. New Challenges in Communication with Cancer Patients. New York, NY: Springer; 2013: 469-478. 4. Health Information National Trends Survey. National Institutes of Health. Cycle 1 Question B4. Oct 2011 – Jan 2012. 6. Lupiáñez-Villanueva F. Citizens and ICT for Health in 14 EU Countries: Results from an Online Panel Survey. ICTconsequences.net. 2011. 7. Fox S, Duggan M. Health Online 2013. Pew Internet & American Life Project, January 15, 2013, http://www.pewinternet.org/Reports/2013/Health-online/Part-One/Section-1.aspx, accessed on May 31, 2013. 8. Rajagopalan M, Khanna V, Leiter Y, Stott M, Showalter T, Dicker A, Lawrence Y. Patient-Oriented Cancer Information on the Internet: A Comparison of Wikipedia and a Professionally Maintained Database. JOP September 2011 vol. 7 no. 5: 319-323. 9. Hu X, Bell R, Kravitzc R and Orranged S. The Prepared Patient: Information Seeking of Online Support Group Members Before Their Medical Appointments. J Health Commun. 2012;17(8):960-78. 10. Stanley S. Smart Patients: Groundbreaking Website Supports Conversations among Cancer Patients. Cancer Commons, April 24, 2013. http://www.cancercommons.org/2013/04/24/smart-patients-groundbreaking-website-supports-conversations-among-cancer-patients/, Accessed on May 31, 2013. 11. https://www.smartpatients.com/faq, Accessed on June 3, 2013. 12. Lee CJ, Gray SW, Lewis N. Internet use leads cancer patients to be active health care consumers. Patient Educ Couns. 2010 Dec;81 Suppl:S63-9. 13. Fox S. Cancer 2.0. Pew Internet & American Life Project, December 13, 2010, http://www.pewinternet.org/Reports/2010/30--Cancer-20/Report/Section-5.aspx, accessed on May 31, 2013. 15. Shriver BD & Sorens M. Patient Advocacy in Sarcoma. In: Pollock RE, Baker LH, O'Sullivan B, Randall RL, eds. Sarcoma Oncology: A Multidisciplinary Approach. PMPH-USA, Ltd; In press. V10N5-6 ESUN Copyright © 2013 Liddy Shriver Sarcoma Initiative.